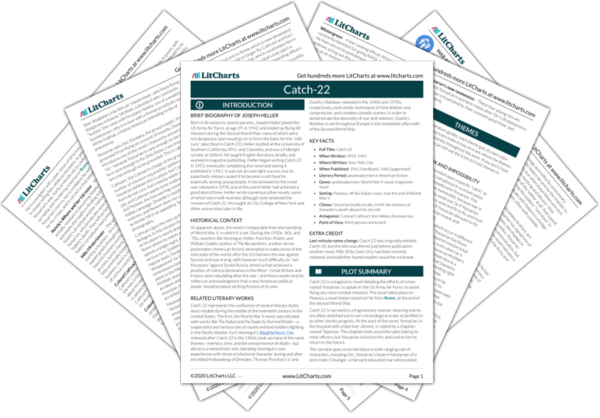 Instant downloads of all 942 LitChart PDFs (including Catch-22). 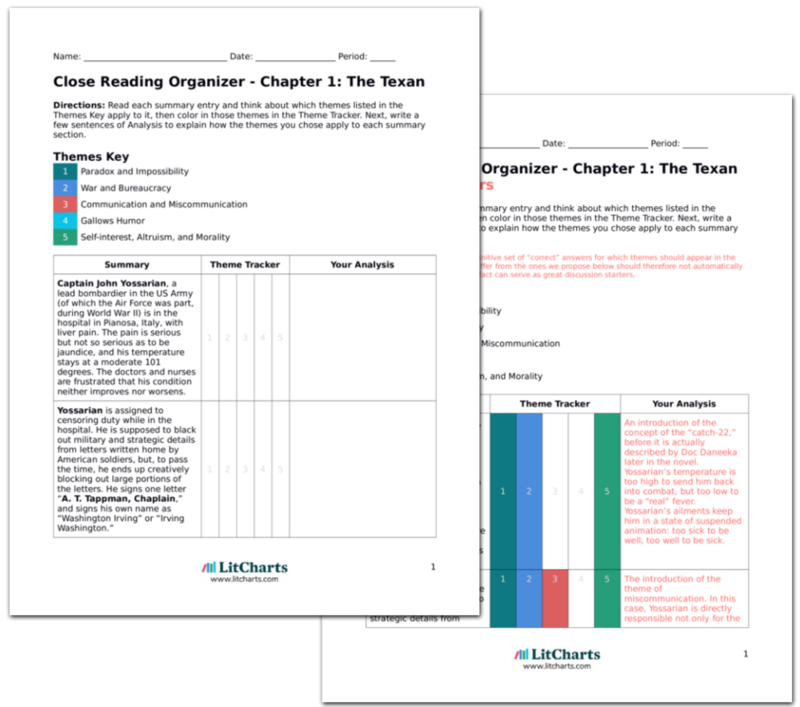 LitCharts assigns a color and icon to each theme in Catch-22, which you can use to track the themes throughout the work. The chaplain begins having a crisis of faith. He wonders whether God exists, and whether he is capable of understanding many of the religious mysteries he is supposed to explain to his fellow soldiers. He has a nagging suspicion that he has seen Yossarian before—before meeting him in the hospital, in the first chapter of the novel. The chaplain begins contemplating whether it is worthwhile at all to serve his God and the men of the group on Pianosa. The chaplain’s faith will be further tested by Nately’s death later in the novel. The chaplain asks Yossarian whether he has ever had this feeling of déjà vu before, and what he thinks it means. Yossarian replies that déjà vu is just a delay in synapses firing in the brain—purely a result of biology. The chaplain asks himself, privately, if he wouldn’t make a better combat soldier or paratrooper than chaplain. The chaplain feels that he is no longer capable of providing any advice to the men who are forced to fly missions. He no longer feels totally comfortable acknowledging his own religious beliefs to himself. The awfulness of the war, and of the army toward its own soldiers, has robbed him of his faith. The chaplain is devoted to his beautiful, kind wife, and to his children. He begins worrying that something terrible will befall them: an accident proving deadly, or a horrific illness. He thinks about the naked man he saw in a tree, not knowing at the time that it was Yossarian, and believes it’s a sign, though he doesn’t knows what it means. Now the hypochondria, which Daneeka has experienced throughout, appears to affect the chaplain, but only as regards his wife and children. The strains and traumas of war are taking their toll on the chaplain’s psyche. The chaplain decides to advocate on behalf of Yossarian to Major Major, arguing that the soldiers should not have their mission requirements continually raised. He walks through the woods to the Major’s office, only to find that he is out. He is told he may wait for the Major, and does—but then feels that the Catch-22 (the Major will only take guests when he is out) is a practical joke aimed at him. He leaves in a huff. As it turns out, Major Major does not allow any guests to come and see him, but the chaplain, who is accustomed to being made fun of, assumes that this directive is established with him particularly in mind. It is unfortunate that the chaplain is turned away just at the moment he has resolved to speak up for Yossarian and the other officers, and this is just another way that the bureaucracy throws up obstacles whenever one of the men tries to protect either himself or any of the other men. 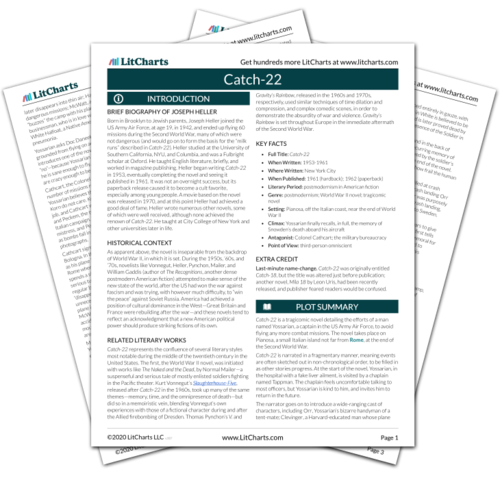 Get the entire Catch-22 LitChart as a printable PDF. The chaplain walks back through the woods and runs into Whitcomb, his assistant, who claims just to have seen Major Major. Whitcomb grows angry that the chaplain won’t tell him his plans with Major Major—Whitcomb complains, once again, that the chaplain “doesn’t know how to delegate responsibility.” Whitcomb claims that Major Major sent a letter to the chaplain “of great importance,’ but that he, Whitcomb, threw the letter away, unopened. Once again, Whitcomb manages to upset the chaplain during the course of the chaplain’s business. Whitcomb derives a special pleasure from annoying the hapless chaplain, and from working behind his back to ensure that the chaplain cannot do his job properly. Frustrated, the chaplain makes his way back to Major Major’s office and demands to see him. Sergeant Towser refuses, and says the Major’s response to Yossarian’s request for fewer missions is simple: there is nothing he, the Major, can do about Catchart’s order. The chaplain is crestfallen. It is not clear what Major Major’s real authority actually is, but it seems reasonable that the major could at the very least petition Cathcart and mention Yossarian’s complaint. But Major Major is loath even to do this. Walking back out into the woods, the chaplain, exhausted at this point from physical exertion, runs into Flume, Chief White Halfoat’s former tent-mate, who has been living in the wild out of fear of the Chief. The chaplain asks him to return to the group, but Flume says he will do so only when the Chief dies of pneumonia, which the Chief plans to do before winter. The chaplain is confused but carries on to his own tent. Flume truly is crazy—he lives out in the woods, as a kind of mountain-man—but his apparent craziness is motivated by a reasonable desire to avoid death at Halfoat’s hands. In this case, he is like Yossarian—both appear crazy, but both only want to protect their own lives. There he runs into Whitcomb again, who in the interim has been promoted to sergeant by Cathcart. The chaplain doesn’t understand how this is possible; Whitcomb informs him that he, Whitcomb, gained Cathcart’s support by presenting a plan to write letters to the family members of all dead and missing soldiers in the group. When the chaplain says later, to Cathcart, that this won’t be possible, since they barely know some of the men personally, Cathcart replies that the chaplain is only being negative, and that these letters could get Catchart’s name into the Saturday Evening Post. Whitcomb seems not to care that these letters will not contain any personal information for the families of the fallen soldiers. Whitcomb only wants to send the letters to curry favor with Cathcart, who, once again, wants to earn a name for himself in American magazines with his very public efforts at “supporting the troops’ families.” Of course, the effort produces something ridiculous and awful—completely impersonal death notices—but such is the way with blind bureaucracies. Later on, the chaplain begins going to the officers’ club more. Dreedle sees this and remarks on it to Cathcart, who assumes Dreedle is angered by it. But Dreedle believes the chaplain should be “mixing with the common men.” Cathcart immediately changes his tune and begins praising the chaplain, and taking responsibility for the chaplain’s appearance in the club. It is never made clear whether the chaplain, who has the rank of an officer, is really allowed to mingle with the other officers in the club. At some times, the chaplain is considered “one of the guys,” and at others he is considered something apart, an alien who does not fly combat missions. This outsiderness fits with the chaplain's role—the officers want him to help them keep the men content, but they don't actually want his Christian morals to get in the way of the men fighting whenever the high-level officers want them to. Dreedle goes on to get drunk at the club and, while making fun of Moodus, he notices that the chaplain is still present. He becomes angered that he is being “judged” by a member of the clergy, and reports to Cathcart that the chaplain should not be permitted in the club. Thus Cathcart has to change his tune again, and ban the chaplain from consorting with the men. The chaplain ends the chapter wondering if it is worth it to serve God in the armed forces. He wonders whether religion is really “real” at all. Now, because Cathcart has been embarrassed by the chaplain’s presence in the officers’ club, the chaplain is no longer “one of the guys,” at least for the foreseeable future. All this bullying, at the hands of Cathcart and Whitcomb primarily, tests the chaplain’s faith, and causes him to try “sinning” a little later in the novel. Schlegel, Chris. "Catch-22 Chapter 25: The Chaplain." LitCharts. LitCharts LLC, 25 Oct 2013. Web. 20 Apr 2019. Schlegel, Chris. "Catch-22 Chapter 25: The Chaplain." LitCharts LLC, October 25, 2013. Retrieved April 20, 2019. https://www.litcharts.com/lit/catch-22/chapter-25-the-chaplain.